New Delhi: Police officers from Telangana rallied around a young cancer patient on Wednesday and helped fulfil his wish to become Police Commissioner. 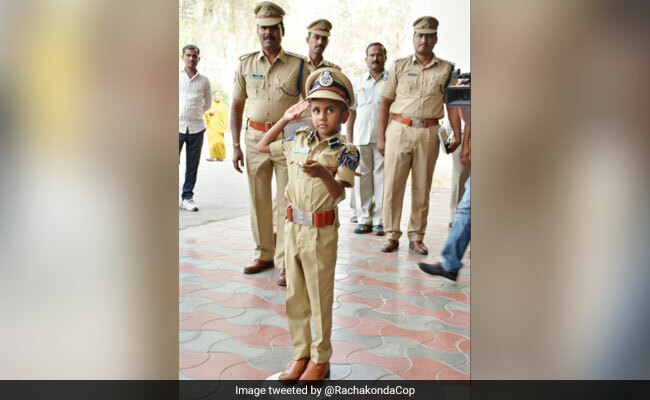 Mahesh Muralidhar Bhagwat, who is the commissioner of Rachakonda Police in Telangana, gladly "gave up" his seat to six-year-old Dudekala Ishan for the day. Photos posted by the IPS officer on social media show the Class II student smartly dressed in khaki. In one photo, Mr Bhagwat and a colleague smile as the young boy makes himself comfortable behind the large desk. In another heartwarming picture, he salutes proudly as police officers look on. News agency ANI also tweeted photos of the Class II student saluting as his family and friends take photos from their mobile phones. The pictures have struck a chord with many netizens. "Salute you hero... keep fighting," urges one person on Twitter. "Hope you will become a real (police commissioner) in your future. God bless you," writes another. "After Mumbai Police initiative this has come out as nice trend. It is really very healthy way to connect with public. Commendable and kind act by Telangana State Police," (sic) tweets a third. Last month, a seven-year-old cancer patient from Mumbai fulfilled his wish of becoming a cop. Arpit Mandal was made police inspector for a day at Mumbai's Mulund police station. Both Arpit and Dudekala were made cops for the day with the help of local police and Make-a-Wish India foundation. The NGO helps grant wishes of children battling serious illnesses.